E: Was the project recently revamped? Please explain how? NC: Hand excavation was used to create new basements underneath the ground floor by reaching the bottom of the vaults and creating new concrete floors. The elevations were restored to their historic and protected state; minor changes were introduced to accommodate contemporary living amenities. The developer created the Khan concept to devaulted units and internal patio unifying the buildings. The retail units and restaurants effectively allow access and interaction to the public. E: Is it recognized as an official heritage project? If so, what classification? 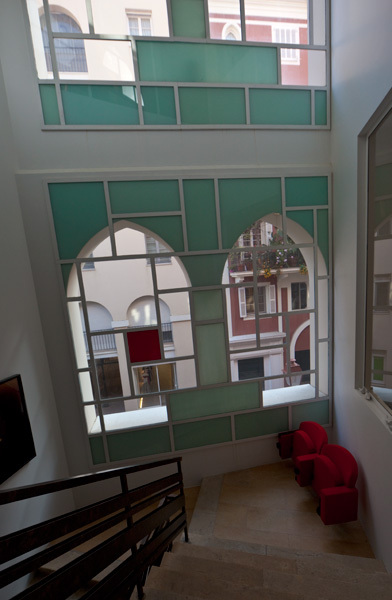 NC: The project comprises several buildings; protection of some by the Lebanese government that classify them as historic and by Solidere that considered them representative of the architectural features in Saifi Village that were worthy of preservation. E: How has it contributed to the community? NC: By setting the example cited above, and by also coordinating the painted façade and the applied mixed-use with the neighboring buildings, be they old or new. As such, Saifi Khan sits comfortably in its environment and serves to bring the traditional to the contemporary and give the new roots in the old. E: What is the long-term commitment of the individual or institution of this project to preserve it over time? NC: As mentioned, the buildings are protected by government decree and by Solidere regulations as master planner. In addition, the users are committed to respect and preserve the restored and historic features. There are also restricted uses for the parts introduced by both the master planner and the developer. Finally, the owners realize that it is in their interest to preserve their asset as it will certainly enhance its value.